Thousands of local European car enthusiasts had the opportunity to meet a few members of the Demon Rally Team a few weeks back at the regions largest and most popular European car show. 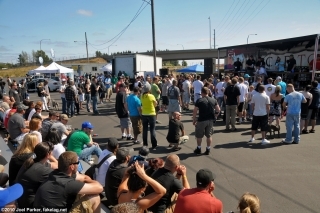 The event was held at Cheney Stadium in Tacoma, Washington on July 17 and 18th, 2010. The event is a motorsports event and car show, on the 17th Brendan of RalleyTuned with a lot of assistance runs a cone squishing autocross competition in the large open parking lot of Cheney stadium. This year, the autocross was a big part of making the event much more than just a car show. Seeing actual motorsports being incorporated into car shows gives the true motorheads hope for the future of motorsports competition. We arrived on Sunday, and in typical Demon Rally fashion the car was not in mint shape, however, also in typical Demon Rally fashion the car was able to make the 60 mile trek from the Demon Rally compound in Seattle, Washington to Tacoma without charging the battery. Unfortunately when we got to the event the battery didn’t have enough juice to fire the motor and we were off to find a battery charger in order to make it back home. We set up a display tent and played highlight videos in the background on our computer and handed out some new fancy business cards to the show goers, a lot of folks started collecting the different images on the business cards and we had started a new fan base without even realizing it! By the end of the event I was dead tired, there were alot of people asking about RP Turbos, about Fine Tuning, JRM, Spitfire EFI, as well as how we put all wheel drive into the Golf. I let them in on the secret that we beat STI’s and EVO’s without All Wheel Drive, because we drive harder and faster than the majority of the field. After selling alot of T-shirts, and touting the car and everyone that works for the team, Tom had a chance to run out through the car show and reminisce about his old VW Rabbits, as well as look at a very inspiring all wheel drive drag Corrado that had a good amount of fabrication lined up in the car. Tom said it was good to see other enthusiasts putting forth effort into the Competition side of cars. It was a long day at the car show, and Tom was beat after chatting up rally and the team, but overall it was a darn good time to meet a lot of local enthusiasts. The team made fresh new contacts in the industry as well as bring rally to new fans. 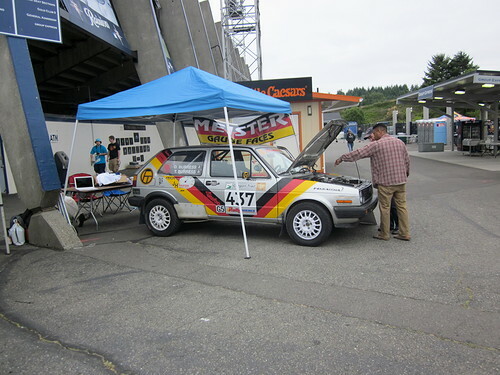 We have to say a huge thank you to Dave Meister of Meister Autowerks for putting on the event at Cheney Stadium. Car shows are a massive undertaking and he has really turned this event into one of the best in the country, so we appreciate his and his staff’s monumental undertaking at this event. 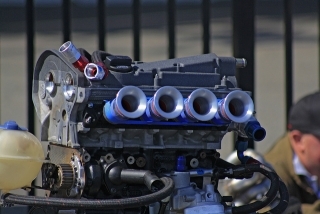 We also want to thank Fine Tuning for their continued and unwavering support of the team, JRM, RalleyTuned, Product Apparel for printing some new shirts for the new car, RP Turbos for turning on slow anemic normally aspirated race car into a fire breathing monster, spitfire EFI for being the best solution for EFI in the pacific northwest. 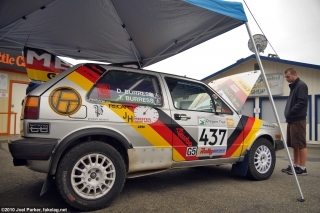 The Demon Rally Team has the best group of folks supporting them, help us by visiting our sponsor’s websites and using them to achieve your motoring goals! You are currently browsing the DemonRally blog archives for August, 2010.